In 1940 a group of civic minded men got together to discuss the possibility of forming a volunteer fire department in Bainbridge Township. At this time, the Township had an agreement with neighboring Chagrin Falls Volunteer Fire Department for fire protection services. With the ever growing expansion of the community and the demand for adequate fire protection, it became obvious that the existing arrangement was not sufficient. There was definitely a need for a fire department within the township, one they could proudly call their own. The township trustees agreed that the building previously used as a town hall, church, basketball court and even a courtroom be renovated into the first fire station. The wooden floors were removed and replaced with concrete, two overhead doors were installed on the street side of the building and a tower was erected on top for the drying of hoses. On July 20, 1942, the township installed a siren to the top of the hose tower. This siren would be used to alert firemen of emergency requests for 47 years as well as a civil defense warning during the second world war. This fire station would be utilized until 1969. On July 31, 1942, the dream became a reality with the incorporation of the "Bainbridge Township Fire Company" and nine charter members. By September 14, 1942 there were 19 members total and the Chief and Line Officers were established. 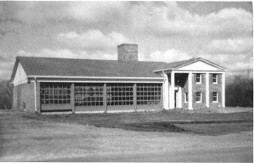 A new Fire Station was erected in 1970 at a site 300 ft. from the original station. This building costing $150,000 was over 7,000 total sq. ft. and able to house the newly purchased pumper and tanker unable to fit in the old station. Featured in this station was a locker room, chief's office, kitchen and training room. With the increase in apparatus sizes and staffing needs because of an ever increasing population, this fire station was renovated again in 1998 to almost 15,000 total sq. ft. costing $800,000. This renovation included living and sleeping quarters, fire prevention and other functional offices, extended apparatus bays and much improved rest room and locker room facilities. First Equipment . . . It was decided to initiate a fundraiser to purchase fire equipment on October 5, 1942. The firemen went door to door obtaining scrap metal, desperately needed for the war effort and valuable enough to provide much needed monies for the fire equipment. On January 26, 1943, the first fire truck was delivered. The Ford truck had a front mounted pump and a tank capacity of 300 gallons and was painted traditional red. An old milk truck chassis was sold to the fire department about the same time. On that chassis was mounted a 1000 gallon tank from a Standard Oil Company delivery truck. This truck was also painted traditional red and a front mounted pump was installed. This was the first water tanker truck. On March 7, 1943, twelve (12) rain coats were purchased to be used by the members when fighting fires being the first protective turnout gear. Until this time the members had little or no protection when fighting a fire. Helmets, however, were not available because the materials were being used by the armed forces fighting in World War II. 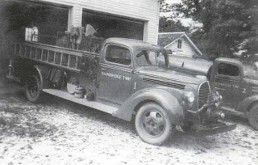 The Fire Company proudly took delivery of their first new vehicle, a 2 ton Chevrolet chassis with an 800 gallon tank and pump on December 15, 1948. This truck cost $5,676.00 with associated equipment and was purchased to replace the water truck. Instead of traditional red, it was painted white as have all of the Bainbridge Township Fire Department vehicles since that time. Emergency Medical Services . . . The Bainbridge Township Fire Department had a genuine interest in first aid training early on. A local resident and Battalion Chief for the Cleveland Fire Department volunteered to teach the "First Aid Course" to the Bainbridge firemen in June of 1943. Following the completion of this training, the fire company purchased a first aid kit to be carried on the pumper. Fire Company members from that time on were instrumental in training the other departments in the area these same skills. On July 17, 1947, a resident in Bainbridge Township was fatally burned after an explosion occurred in his residence while trying to light a hot water heater in his basement. Because of the lengthy wait for an ambulance coming from a funeral home in neighboring Chagrin Falls, the firemen began to consider strongly the option to purchase an emergency rescue vehicle of their own. A 1950 Chevrolet Station Wagon was purchased on February 12, 1950. The equipment for this new vehicle consisted of a stretcher, two-way radio, resuscitator, drag lines for use in drownings and first aid kits. This vehicle was the first volunteer rescue squad in Ohio. The Fire Company purchased another rescue squad in 1956 with funds from the Annual Spring Ball and a traveling circus. The new Pontiac Station Wagon had several advantages over the original 1950 Chevrolet Station Wagon. Lack of adequate room, poor handling and a poor electrical system were a few of the problems that prompted the new purchase. The fire Company has been using a two squad system ever since. The rescue service first responded as a Paramedic Service in 1978 with the graduation of two members from paramedic school. This enabled the department to give life saving medications prior to their arriving at the hospital. This was a significant step for the department in treating injured and ill patients.